It is the age of connectivity and this has extended to the automotive industry as well. The global connected car market is expected to grow at an exponential rate over the next five years. 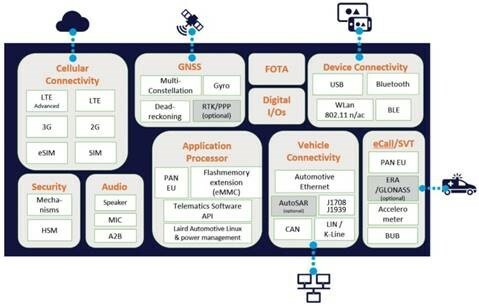 Leading technology company Laird has announced that the company is launching the first fully integrated and scalable module for secure mobile connectivity and automotive ethernet for the automotive industry. This new solution called Laird MA (Modular Automotive Connectivity Solution) will provide motorists with reliable Internet use inside and outside the vehicle. It will serve as a platform that will integrate state-of-the-art communications technologies, a Linux based security module and Laird’s integrated antenna system and will be characterized by flexibility, scalability, and an open software concept. Commenting on the new platform, Laird Vice President of Product Management Guido Dornbusch said that MAX would not only provide added safety and comfort for drivers and passengers but would also facilitate a wide range of services ranging from driver-assisted navigation, advanced diagnostics for maintenance, theft protection, over-the-air software updates, and other benefits which can be scaled to cater to the needs of automotive manufacturers and end users. IHS Markit conducted a study projecting that the global sales of connected cars will reach 72.5 million in the next five years. This could mean that by 2023, about 70 percent of all passenger vehicles on the roads would have the capacity to data with external sources, thus leading to the availability of new services and the launch of new business models, especially in North America, Europe and Asia. Laird Product Director of Vehicle Communication Devices, Dietmar Schnepp said that the modularization of MAX will allow automotive manufacturers to have a short time-to-market when compared to tailor-made solutions. “The platform can be integrated into a Laird system solution, including control unit and antenna, and used for external service providers as the basis for a back-end connection or for app development, which is especially attractive for smaller companies,” Schnepp added. Dornbusch said the platform is highly flexible and this will make it attractive to those customers who only need networking for small batches. MAX will provide end-users requiring high volumes of data to have an optimal cost-per-feature solution. Some of the applications that can be implemented on MAX include a remote diagnostic tool, Internet gateway functionality, location functions, and driver statistics. There is immense potential for a wide range of apps that could be of use to fleet operators, OEMs, insurance companies, and other industry-related entities. MAX is also environmentally friendly as the use of custom features minimizes the number of components and their weight. This would optimize energy management and help reduce consumption of power consumption. This would help make vehicles more efficient, especially in the case of electric vehicles.